JBL announces four Link products with Google Assistant at IFA 2018 | What Hi-Fi? Built-in Google Assistant and Chromecast lets you ask questions and stream music across JBL's new soundbar, smart speaker with display and two headphones. 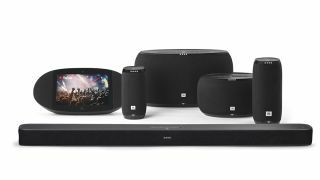 Adding to its Link range of connected devices, JBL has announced four products – the Link Bar soundbar, Link View smart speaker with a screen, and two Everest GA headphones – all of which are integrated with Google Assistant voice control. Along with all the general questions you ask your voice assistant, you can ask Google Assistant to play music from your Spotify, Deezer, Google Play Music or YouTube Music account across all Link products. Chromecast built-in is also featured across all these products, and lets you wirelessly cast music or video content from your smartphone or tablet. The JBL Link Bar is a £350 soundbar with three HDMI inputs and one HDMI ARC output, all compatible with 4K playback. It has Bluetooth and Android TV built in as well, and you can add an optional subwoofer for £300. The Bar will be available in Spring 2019. The JBL Link View is a smart speaker with an 8in HD touch screen display, and a 5MP front-facing camera for making video calls. It also supports Bluetooth, 24-bit/96kHz hi-res audio streaming via Chromecast, and has a dedicated passive radiator for deep, rich bass. It’s also IPX4 rated, meaning it’s splash proof, and you can of course use voice control to call friends, watch YouTube videos, look at holiday photos, and connect with other JBL Link products for multi-room streaming. It will go on sale for £250 in 2019. And finally, the JBL Everest 710GA over-ear wireless headphones and Everest 110GA in-ears wireless headphones - which were first shown at CES 2018 - finally has UK prices of £230 and £90 respectively.